In yet another example of so-called children's' entertainment we see Bernie the Bear languishing away in a zoo. 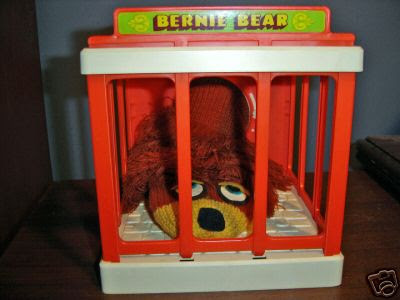 Poor Bernie has been ripped from his natural habitat only to suffer decades of degradation on a slab of icy concrete in cramped quarters behind steel bars. Your little ones can reenact his days of public torture with this puppet. It may as well come with a tiny sack of stale peanuts to pelt him with.